Some people buy shoes, clothes, perfume or music to cheer themselves up. I buy cheese. Probably once every few weeks I'll go on a cheese splurge and pick up wedges of Cornish Yarg, Aged Red Leicester, Capricorn goat's cheese and Cropwell Bishop Stilton. We'll have a cheese and crackers night and then at the end of the week after some sandwiches there will usually be a pile of ends of cheese wedges that need using up. And then I make this tart. It's easy to make, and will feed 6 people, generously. The slices are fairly thin, but as you'd expect, the tart is quite filling and rich. I like to eat this with some greens or a dressed green salad, or skinny fries. Mix the flour and salt together in a large bowl and then add the cold diced butter and the Trex. Rub with your fingertips until it looks like breadcrumbs and then pour in the iced water. Mix to form a dough, wrap in cling film or drop into a polythene bag and chill in the fridge for 15 minutes, while you get on with the filling. Fry the onions in a little olive oil until soft, and then put to one side. In a bowl whisk together the eggs, the cream and season lightly with salt and black pepper. Take out the pastry and roll it out, using it to line a tart or flan dish. Cover with greaseproof paper and baking beans (or rice) and bake at 160ºC for 15 minutes. Remove the paper and baking beans (careful - they'll be hot!) and then bake uncovered for another 10 minutes. Once the pastry case is golden, break up the cheese and arrange in a thin layer into the tart case. 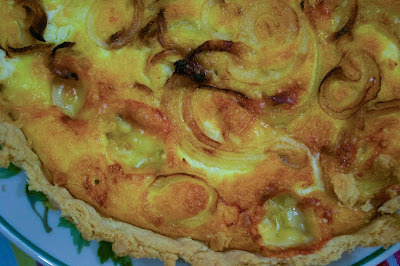 Scatter over the fried, softened onions and then pour in the egg and cream mixture. Slide straight into the oven again and bake for another 35-40 minutes, until the tart filling is set. Best served slightly warm. Do you have any tips for using up leftover cheese? This sounds perfect since we have a ton of cheese to use up. We love onions, too. Thanks for posting this recipe.